A coil of wire becomes an electromagnet when current passes through it. The electromagnet interacts with a permanent magnet, causing the coil to spin. Voilà! You’ve created an electric motor. Wind the copper wire into a coil about 1 inch (2.5 cm) in diameter. Make four or five loops. Wrap the ends of the wire around the coil a couple of times on opposite sides to hold the coil together. Leave approximately 2 inches (5 cm) projecting from each side of the coil, and cut off any extra (click to enlarge photo below). If you are using insulated wire, strip the insulation off the ends of the wire projecting from the coil. If you are using enameled wire, use sandpaper to remove the enamel. Cut or tear two 1-inch-wide (2.5-cm-wide) strips of aluminum foil. Unfold one end of each paper clip. On the unfolded section of each paper clip, wrap and tape the end of an aluminum foil strip. Make sure the foil makes a good contact with the clip. Turn the cup upside down. 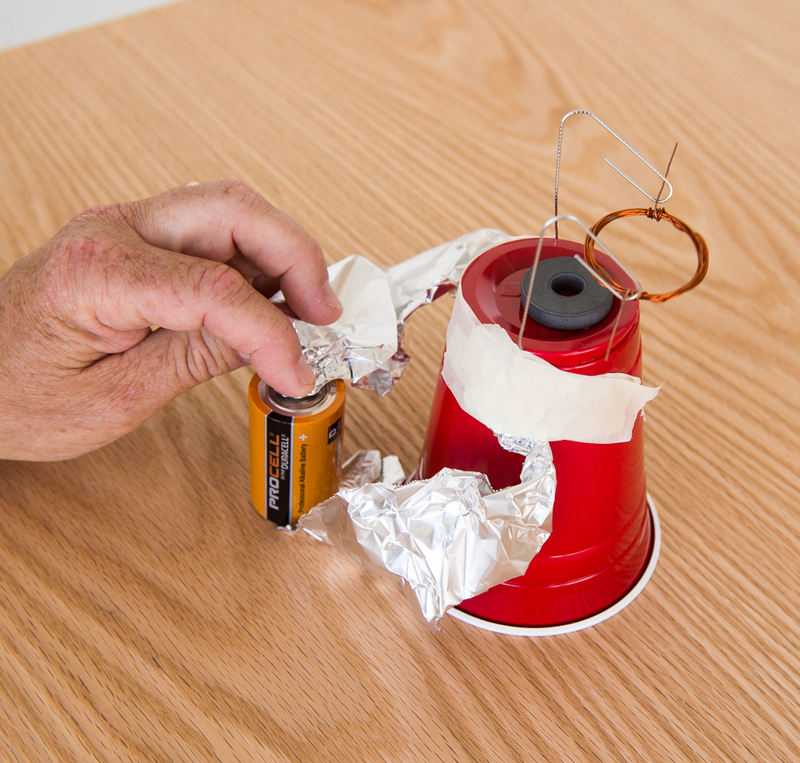 Tape the paper clips to opposite sides of the bottom of the cup, with the clips' unfolded ends pointing down and the aluminum foil trailing away from the cup. Keeping the cup upside down, place one magnet over the center of the bottom of the cup, and then put one finger over the magnet to hold it in place. Now, flip the cup right-side up. Attach one or more magnets to the inside the cup, directly beneath the original magnet. This will create a strong magnetic field as well as hold the outside/top magnet in place. Your view of the inside of the cup should look like the photo below (click to enlarge). Rest the ends of the copper-wire coil in the cradles formed by the loops in the paper clips. Adjust the height of the paper clips so that when the coil spins, it clears the magnet by about 1/16 inch (1.5 mm). Make sure the two trailing strips of aluminum foil aren't touching each other. Stand your battery on top of one of the foil strips, so that it rests on and makes contact with the foil. Now, touch the other foil strip to the other end of the battery. Give the coil a spin to start it turning. If it doesn’t keep spinning on its own, check to make sure that the coil assembly is well balanced when spinning, that the enamel has been thoroughly scraped off (if you used enameled wire), that the projecting end has been painted with black marking pen, and that the coil and the magnet are close to each other but do not hit each other. You might also try adjusting the distance separating the paper-clip cradles: This may affect the quality of the contact between the coil and the cradles. You might need to squeeze the unfolded ends of the paper clips to ensure that the aluminum foil is making a good electrical contact. Keep making adjustments until the motor works. Have patience! The success rate with this design has been quite good. 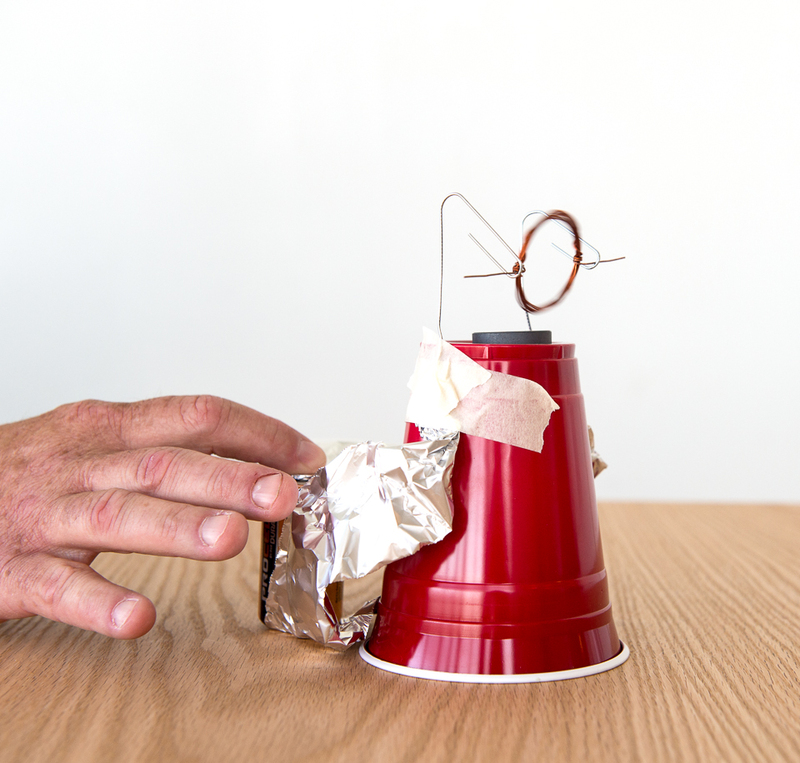 Current flows through the battery, aluminum foil, and paper clips, and into the wire coil, creating an electromagnet. One face of the coil becomes a north pole; the other a south pole. The permanent magnet attracts its opposite pole on the coil and repels its like pole, causing the coil to spin. Another way to describe the operation of the motor is to say that the permanent magnets exert forces on the electrical currents flowing through the loop of wire. When the loop of wire is in a vertical plane, the forces on the top and bottom wires of the loop will be in opposite directions. These oppositely directed forces produce a twisting force, or torque, on the loop of wire that makes it turn. Why is it so important to paint half of one projecting wire black? Suppose that the permanent magnets are mounted with their north poles facing upward. The north pole of the permanent magnet will repel the north pole of the loop electromagnet and attract the south pole. But once the south pole of the loop electromagnet is next to the north pole of the permanent magnet, it will stay there. Any push on the loop will merely set it rocking about this equilibrium position. By painting half of one end black, you prevent current from flowing for half of each spin. The magnetic field of the loop electromagnet is turned off for that half-spin. As the south pole of the loop electromagnet comes closest to the permanent magnet, the paint turns off the electric current. The inertia of the rotating coil carries it through half of a turn, past the insulating paint. When the electric current starts to flow again, the twisting force is in the same direction as it was before. The coil continues to rotate in the same direction. You can experiment with this device by switching the terminals on the battery, adding a battery, or flipping the magnets. Try adding more magnets, or change the position of the magnets. See what happens! In this motor, the sliding electrical contact between the ends of the coil of wire and the paper clips turns off the current for half of each cycle. Such sliding contacts are known as commutators. Most direct-current electric motors use more complicated commutators that reverse the direction of current flow through the loop every half cycle. The more complicated motors are twice as powerful as the motor described here. This motor can also be used to demonstrate how a generator works. Try hooking up the ends of the paper clips to a sensitive galvanometer instead of the battery. Spin the coil and see if any current registers on the meter.